Yes, that’s right and to top it off we think this is probably one of the most affordable headcollars for dogs. Please enter dog breed (or mix) or weight. The Simple Leader Headcollar for Dogs was made in 2017 and very well received by the pet owning public, however, we wanted to make a headcollar that broke down all the barriers of buying and subsequently prevented dog owners from enjoying walks with their dogs. The Simple Leader – 1 size fits all – no need to measure, you just pick your colour and you’re sorted. Made from a soft cushion web fabric, 19mm – an optimum width for dogs of all shapes and sizes. So what are you waiting for? There’s no size chart, no need for a tape measure, click to buy and your life with your dog may well be transformed. If you want a padded Simple Leader, just click here to buy a more customisable headcollar. 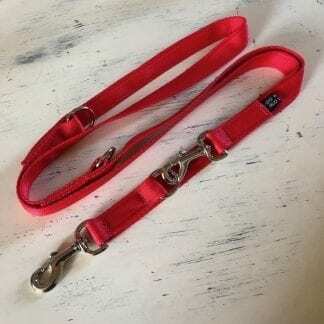 If you are looking for safety, our Head Collar Dog Safety Lead may be the answer. With our LifeTime Stitching Guarantee, we are sure you will be a happy customer!